You may recall in a previous post I mentioned that my two fall favorite treats were The Breadsmith’s Apple Pie Bread and Merb’s Candy Apples. While I’ve managed to come close to recreating the Apple Pie Bread (I think mine is better) I was still on my quest for duplicating Merb’s Candy Apples. Last year I made a chocolaty, rich, and gooey Chocolate Caramel Apple that is so heavenly, and now I can say I’ve conquered the ooey gooeyness of the Merb’s Candy Apple. Mine may have a tad more butter in the mix than Merb’s, but oh yeah – it’s real good! If you’re a fan of Caramel Apples you’ll definitely want to try these. Tip: Be sure when you’re making the caramel there aren’t any drafts in the room, or it will take longer for the caramel to reach that firm ball stage of 247-248 degrees F. It’s also imperative that you have a working Candy Thermometer, otherwise you’ll waste your time standing at the stove, and ruin a perfectly good batch of caramel. This recipe is simple to make, but you have to babysit the pot – not your children! Hot caramel spilled can cause serious burns on the skin, so do use caution. I hope you’ll try my Caramel Apples, just in time for Halloween. Perfect to share with friends and neighbors, doctored up with pecans, m&m’s, coconut, chocolate & white chocolate drizzles, and whatever else you can think of. Place them in cellophane sleeves and tie at the top with a ribbon and card. What could say Halloween and fall more than these? If you're familiar with Merb's Candy Apples from St. Louis, Missouri you'll want to be sure to try these. In a heavy 6 quart pot, combine sugars, corn syrup, butter, cream and salt. Bring to a boil over medium-high heat, stirring constantly with a wooden spoon. Allow to maintain a rapid boil. Using a pastry brush dipped in warm water, wipe any sugar that clings to the sides of the pot. Clip a candy thermometer to the side of the pot, with tip immersed inside - do not allow tip of thermometer to touch the base of the pot or you will get an incorrect reading. After about 10-15 minutes, when you have a temperature reading of 247-248 F degrees, remove from heat. Carefully add vanilla extract and blend. Pour caramel into a heatproof medium sized bowl. Do not scrape the bottom, just allow to drip, in the event any caramel burned or stuck to the pot. Allow to cool 5 minutes before dipping apples. Insert stick into stem side of apple. Dip the apple into the caramel slowly swirling until completely coated. Allow excess to drip back into the bow while swirling. If the caramel runs off quickly, allow caramel to cool a bit longer as it may still be too hot. If garnishing with chopped pecans, m&m's, etc. immediately dip freshly coated caramel apple into garnishes. Coat as desired, and if necessary pat garnishes gently into place. Place apple, stick side up, on parchment lined baking sheet. Allow to cool. Tip: If caramel starts to harden before coating all the apples, place in the microwave checking at 10-second intervals for up to 30 seconds or until fluid again. Apples will keep refrigerated for 2-3 days. Remove from refrigerated about 15 minutes prior to serving to allow caramel soften up. Merbs is a local company that’s been around for as long as I can remember. They make great chocolates and the best caramel apples. In fact some of the grocery stores will post signs that Merb’s Apples are coming soon – that’s how popular they are. I hope you’ll try these. Oh, boy, you’ve featured one of my favorite treats of all times! The last time I remember eating a caramel apple, I was pregnant with my 20 y/o. I think it’s time for another indulgence! Oh goodness, I could never wait that long to eat another caramel apple. That must be why you’re so skinny. You have better self control than I do. I hope you’ll try these. Also if you have any leftover caramel just line a container with foil that has non-stick spray on it and pour away. Let harden, remove foil from pan and slice. Yummo! Then you’ll love these Chris. I hope you’ll try them. Caramel apples are so great, aren’t they? I haven’t made these in forever. Love the flavor of them! Yours look terrific – thanks so much. Are you a Merb’s fan John? They’re my favorite. Although mine may be now, plus they’re a heck of a lot cheaper to make than purchase. I’ve been wanting to make caramel apples for so long now! Yours look amazing! They are so good. The caramel is soft, creamy and buttery, I think you’ll like them. I hope you try them. Your caramel dipped apples look absolutely divine and perfect for the season! They definitely say fall. I shared a few of them with the neighbors, they seemed quite pleased. What does you daughter fuss about – that she wants some? You’ll have a nice batch of caramel apples from these for everyone in the family to indulge in. They’re so delicious and fresh tasting. I hope you try making them. 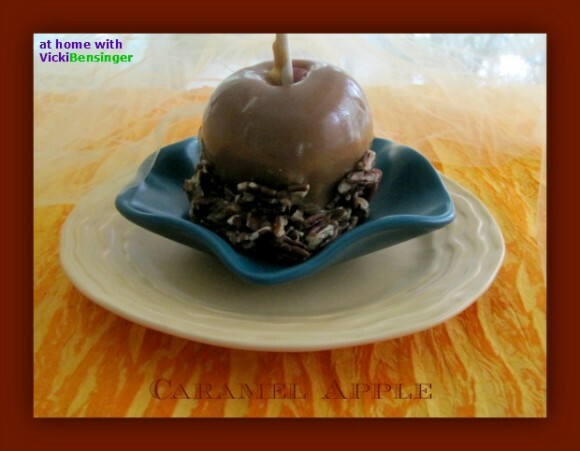 This caramel apples sound delicious…buttery…yes! I love the creamy buttery texture together with the crunchy apple…yum! Vicki, thank you so much for the kind words, I really appreciate the support. Anytime Juliana. Good luck with your move. 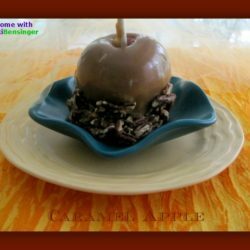 I hope you’ll try my caramel apple recipe. You are a girl after my heart! I LOVE caramel apples!! One of the neighbors use to make them for Halloween for the neighborhood kids. They were so good! These look delicious Vicki! I shared a few with the neighbors and they were very happy. I love making special treats for the neighborhood kids but quit giving them on Halloween and instead deliver them personally to their homes. I felt it was safer and better that way. I hope you’ll try these and share them with your neighbors as well. I love caramel all the way..
but since i had a trauma to handling caramel that cause my finger nails seriously injured..
i let my sister handle this kind of sweet bites…..
Love the sound of these and the different decorations look fab! They are fabulous and have to say that the m&m apples went first. I hope you try them. I know a few kids that would love to be biting into one of these! So delicious looking! I never bite into them. I use a knife and slice off pieces for myself. This way I not only ration how much I eat but don’t end up with a sticky face. Of course, kids love having a sticky face – it’s more fun that way. I hope you’ll try these. I love anything with coconut. I hope you’ll try these they really are so good! You make the most delicious-looking food. I could never bite into one as a kid because I’ve never liked food on my face. Weird, I know. Thank you Maureen that’s such a nice compliment. Both my husband and daughter finished off the m&m caramel apples. As for eating caramel apples from the stick, I’m with you. I hate having that sticky gooey caramel stuck to my nose and cheeks. It’s just easier to slice it with a knife. But I think so I could make an exception once with your buttery caramel apples. This looks so good butter and all. I love it with nuts. You know growing up we never had anything like this. When I came here in the 90’s, saw so much of these at grocery stores. Very curious, I got one from the grocery store, and ohhhh my, I still remember, I was addicted. I just love this one. Haven’t made in a while, glad for beautiful apple season. Well I hope you’ll try these. They’re well worth the effort. Wow – these look so good! My daughter and I were trying to figure out what to do with some of the apples from our apple picking expedition – so I was glad to have stumbled on your blog to see this – thank you for sharing! 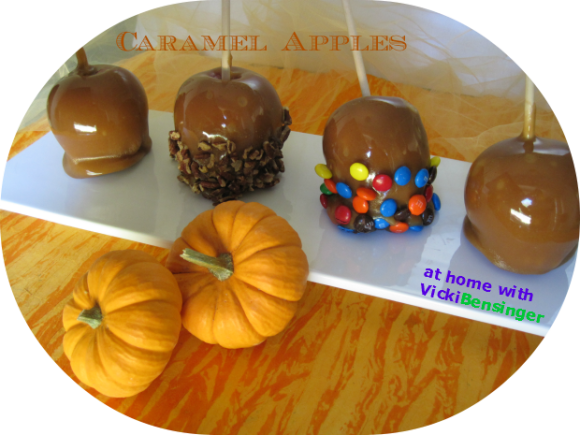 I hope you’ll try these along with my gourmet chocolate caramel apples. I think you’ll love both of them. Caramel apples are just the right thing for Halloween! Loved the picture!! They are a great treat for Halloween and fun to make to give to the neighborhood children. They’re always a special treat anytime of the year but especially in the fall. These look so good right now!! I wish I had one to sink my teeth in to!! !